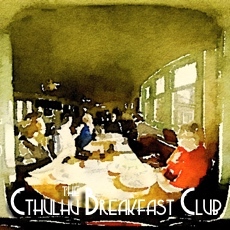 Sat before a crackling fire with a mug of cocoa and a musty tome (that’s June in the UK for you), I listened in good company to the latest podcast from the Patreon-funded Cthulhu Breakfast Club. 90-minutes of fine Mythos-focussed banter from Paul Maclean and chums – from Yog-Sothoth.com – they provide a 5-minute potted review of The Cthulhu Hack. The Cthulhu Hack is based on The Black Hack – a super lite set of rules based on the Original Fantasy Gaming system. The Cthulhu Hack is a Lovecraftian variant. £4 in book form, with an option for a PDF or a ‘White box’ edition. Very light system. It has levels, classes, hit points – so you can see the system in the background. It’s an interesting, nice little light system. 40-odd pages long. A brief description of the Mythos. A load of monsters. And quite a large number of character ideas. It’s a d20 system, but what’s different about it is the creatures, the baddies… they never roll anything. It’s all based on Save rolls. (Characters also have a) Sanity die that works on a tiered system – d12, d10, d8 and so on – where if you roll a 1 or 2 your die size goes down. It’s cheeking my interest. The PDF is available on DriveThru and RPGNow. Available for a few pounds. Might be interesting for a one-off or a short run. If you want an entire roleplaying game for about £4 in print – The Cthulhu Hack… it’s worth a shot. I’d like to hear more if they get an opportunity to give the game a spin. I think getting a game in would help solidify the appreciation for the completeness and simplicity of the system. You can hear the whole review, along with coverage of Pulp Cthulhu, UK Games Expo 2016, the Lovecraftian Horniman, Convicts & Cthulhu and more besides, by becoming a Patreon.